Advances in harvesting and processing technology during the second half of the twentieth century resulted in dramatic and ultimately devastating changes to the Newfoundland and Labrador fisheries. More efficient nets and other gear led to greater catch rates, while powerful new vessels with onboard processing facilities allowed local and foreign fleets to fish off the Newfoundland and Labrador coasts for longer periods of time than ever before. After a new market for frozen fish emerged in the United States following the Second World War, Newfoundland and Labrador shifted away from its traditional and family-based mercantile saltfish trade with European, South American and Caribbean countries toward the increasingly industrialized sphere of North American consumer culture. Fishers caught groundfish in company-owned trawlers, workers processed the catch in company-owned plants, and consumers found the final products in the frozen food sections of North American supermarkets. The Sandra Gage docked at St. John's. Photo by Harry Stone. Reproduced by the permission of the Maritime History Archive (PF-001.1-M36a), Memorial University, St. John's, NL. Although fishing vessels and gears continued to improve throughout the twentieth century, regulations governing their use did not progress accordingly and in the end failed to protect the cod stocks from overexploitation. 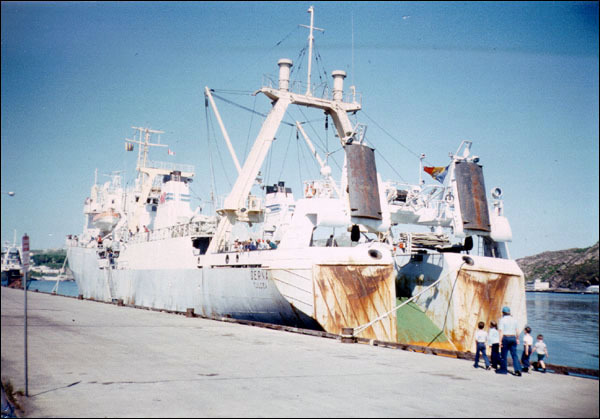 It was not until the 1970s that the international community established quotas to preserve the stocks and that Canada extended a 200-mile limit to safeguard its coastal waters from foreign trawlers. Decades of overfishing, however, had by then severely depleted the fish stocks and the Canadian government announced a moratorium on the commercial exploitation of Northern cod in 1992. Although the frozen fish industry made significant strides in Newfoundland and Labrador following Confederation, it was during the Second World War that the country first began to investigate the emerging sector. Scientists in the United States developed a quick freeze method in the late 1930s which allowed the Newfoundland and Labrador industry to preserve its fish exports without having to salt them. The process, which involved quickly freezing fish between cold metal plates, yielded a product that tasted almost as good as fresh fish, but had a much longer shelf life. Britain's war-time demand for food imports created a sudden market for frozen fish in the 1940s. By the end of hostilities, Newfoundland and Labrador had exported 10 million pounds of frozen fish fillets overseas and both the Commission of Government and private investors were supporting the country's growing frozen fish sector. Although it was apparent that Britain would not remain a major importer of frozen fish during peacetime, the United States was emerging as an important new market. Aside from the new demand for frozen fish products, the Commission of Government also supported the industry because it was more closely regulated than the saltfishery. By hiring workers to process fish in a handful of company-owned plants, the Commission felt fish exports would be of a superior and more uniform quality than in the saltfishery, which traditionally required fishers and their relatives to cure fish on family-owned flakes. The government encouraged firms to join the new industry and between 1943 and 1949 loaned more than $800,000 to companies involved in frozen fish production. After Confederation, the Canadian government assumed jurisdiction over the fishery's harvesting sector, while the new provincial government maintained control of the onshore processing sector. Both levels of administration continued to support Newfoundland and Labrador's growing frozen-fish industry by developing educational programs for fishers, through loans to fish firms, and by helping to build better vessels and fishing gear. Still, many fishers continued to participate in the saltfishery, and it was not until 1964 that the province's frozen fish production surpassed its saltfish production. At the start of the twentieth century, most fishers sailed to the Grand Banks in schooners (also known as bankers) to participate in the international northern cod fishery. Once on the banks, fishers took to the water in dories to catch fish with trawl lines, handlines, or jiggers. 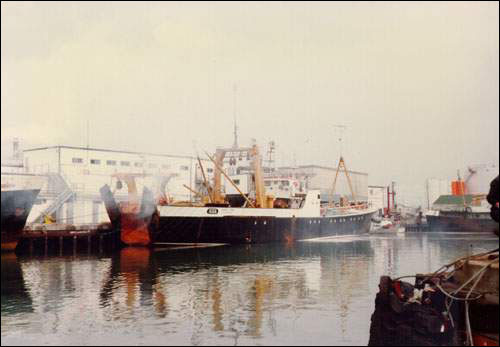 As steam and diesel engines became more widespread during the early portion of the 1900s, trawlers (also known as draggers) began to replace schooners on the banks. These vessels were larger, stronger, and more efficient than schooners and allowed crews to preserve their catch for up to two weeks in crushed ice. Instead of fishing from dories, trawler crews remained onboard and lowered large bag-shaped nets known as otter trawls into the water to catch cod and other groundfish. Trawlers dragged the nets through the water before fishers hauled them back onboard, emptied the catch, and lowered the gear back into the water to continue fishing. Depending on the trawler type, fishers either lowered the nets from the vessel's side or from its stern (rear). A Romanian factory stern trawler docked at St. John's. Photo by Harry Stone. Reproduced by the permission of the Maritime History Archive (PF-001.1-L13b), Memorial University, St. John's, NL. Side trawlers were the first to appear on the Grand Banks after France began using them in 1907. To pull the catch in, side trawlers had to come to a full stop with their sides facing the wind. This placed the vessels at risk of being damaged by strong winds and they often had to stop fishing in stormy weather. By the mid-1900s, stern trawlers began appearing on the banks with increasing regularity. These vessels were more versatile than side trawlers and could fish in all types of weather. 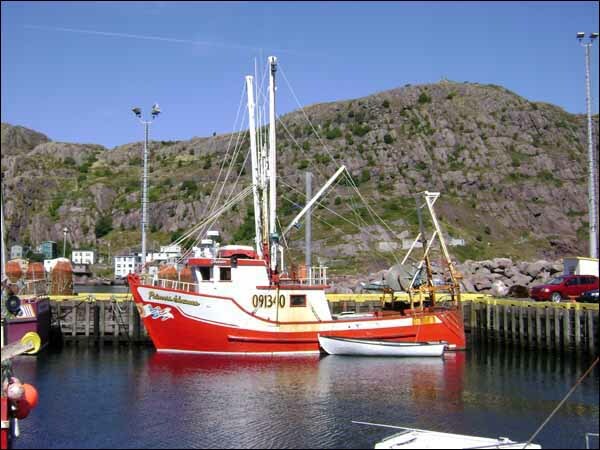 Newfoundland and Labrador began using side trawlers in the 1930s and stern trawlers in the 1960s. Alongside improvements to vessel and net design, a variety of other technological developments impacted the fishery during the second half of the twentieth century. Advances in sonar, radar, and other fish-finding aids during the 1960s made it possible for fishers to detect and track schools of fish. Many vessels also began carrying Loran C navigational systems in the 1980s. These low-frequency radio transmitters allowed fishers to determine the exact longitude and latitude of their position, the location of fish stocks, and the orientation of gillnets. However, the appearance of factory freezer stern trawlers in the 1950s truly revolutionized deep-sea fishing. Fishers could not only harvest more cod than ever before, but could also process their catch onboard. When the first of these vessels, the British Fairtry, arrived on the Grand Banks in 1954, it measured more than 280 feet long, weighed 2,600 gross tons, and was equipped with quick-freezing facilities, cold-storage units, automated filleting machines, and a fish reduction (fishmeal) unit. Soon, hundreds of factory freezer trawlers began arriving on the banks from all over the world. Northern cod catches rose dramatically and peaked at 810,000 tons in 1968. The cod stocks, however, could not withstand such intense fishing and catch rates declined throughout the 1970s. Technological advancements also increased the efficiency of Newfoundland and Labrador's inshore fishery following Confederation. By the end of the 1960s, many inshore fishers were using diesel-powered engines and had replaced their small open boats with larger decked vessels known as longliners. These ships measured between 35 and 60 feet long, could travel further afield than traditional inshore vessels, and allowed fishers to use a greater variety of gear, including gillnets, longlines (a single fishing line attached to hundreds of shorter baited lines), and cod traps. Electronic navigational aids and fish-finding instruments also helped fishers locate the most abundant fishing grounds. By the end of the 1960s, many Newfoundland and Labrador inshore fishers had replaced their small open boats with larger decked vessels known as longliners. Photo by Jenny Higgins. ©2007. One of the largest changes to affect the inshore fishery after Confederation, however, was the industry's shift away from the saltfishery and towards the frozen fish sector. Instead of curing their catch and trading it to local merchants, inshore fishers began selling fresh fish to company-owned processing plants for cash. Unlike the offshore fishery, which made the transition from a seasonal to a year-round industry, most catches within the inshore fishery took place between June and September. Following Confederation, Newfoundland and Labrador's processing sector shifted away from the preparation of saltfish on community flakes and towards the production of fresh/frozen groundfish products in company-owned plants. By 1978, about 150 plants employed upwards of 8,000 workers across the province. Many of these men and women had to work fast-paced and repetitive jobs on assembly lines. Their work could involve skinning, filleting, deboning, deworming, weighing, or packing fish for export to North American markets. Companies usually shipped the products as frozen fillets or in 10-pound blocks of frozen fish pieces. Often, these were the raw materials from which New England or other American companies could manufacture fish sticks and other consumer goods. Following the cod moratorium in 1992, many fish plants in the province had to close or lay off employees. The growth of the shellfish industry in the late 1990s allowed many workers to find jobs processing crab, shrimp, and other shellfish. According to government statistics, an average 6,900 men and women worked in 138 processing plants across the province in 2005.